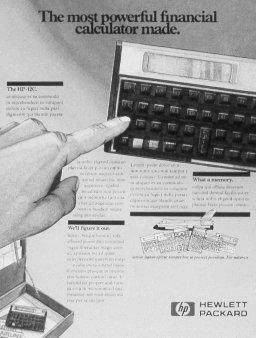 The HP-12C is a financial calculator made by Hewlett-Packard. Due to its gold-colored, and thus prestigious-looking, faceplate, and simple operation for key financial calculations, it has been very popular over the years among financial professionals. It is in fact HP’s longest and best selling model, in continual production since its introduction in 1981. Caption: The most powerful financial calculator made. 1981, the first business "personal computer" was unveiled, Pac-Man was the blockbuster video game, and Chariots of Fire was a box office hit. When floppy disks were still floppy and 5.25 inches square, and a computer’s memory was still measured in kilobytes instead of megabytes. The designers HP-12c decided to lay out the calculator in a horizontal position, partly because it would accommodate all the keys and many adding machines were oriented horizontally. The gold-on-brown colors gave the little calculator an air of seriousness and value that made it a status symbol sitting on a desk. The HP 12c team concluded that they would design the calculations in the 12c to be so precise that the calculator could receive certification by the federal Bureau of Standards (now the National Institute of Standards and Technology). Hence, HP 12c’s results were legally accurate for the banking industry. The algorithms used to perform calculations such as bond interest and partial payments on home mortgages were critical if the calculator was to be trusted by the financial world and meet the U.S. standards. HP consulted with experts from various countries to be certain that the calculator would work in markets using different methods of calculation all over the world. HP worked with William Kahan, UC Berkeley’s renowned professor of mathematics, electrical engineering and computer science, to develop and test the complex algorithms. Tagged By: Silver anniversary dawns for HP’s iconic calculator.